Great for plinking at the cabin, tactical exercises or punching paper at the range. Ammo comes sealed in a 120-rd. ammo can, and includes a plastic ammo box. Designed specifically for use in rifles with a free-floating firing pin. It's ammo with consistent and dependable performance you can rely on, shot after shot. Federal American Eagle XM855, .223 (5.56x45mm), FMJ, 62 Grain, 120 Rounds with Polymer Ammo Box is rated 4.7 out of 5 by 99. Rated 5 out of 5 by Akell from Stable and Accurate I shoot M855 out of a 16" 1-7 twist barrel. It has a more consistent POI than M193, at least it does for me. It is also less expensive than 69 grain projectile cartridges of similar quality. 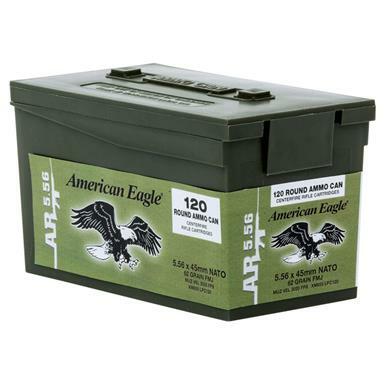 Rated 4 out of 5 by Jonny2A from Buy it for the ammo not the box I bought this ammo for long term storage so I can't really review the ammo other than it looks like decent quality green tip ammo. What I did want to comment on are the plastic boxes. I ordered 5 boxes of ammo and 3 of the boxes arrived broken. There was lots of padding in the shipping box and it arrived undamaged which makes me believe the plastic boxes were sent broken. Also, in the description it says that the ammo is sealed. It is not sealed. The ammo is lose inside the plastic box and there is no seal at all. I just thought customers need to know this before ordering. I would have given it 5 stars if I received unbroken boxes. Rated 5 out of 5 by Doc101 from Perfect Use this ammo on a regular basis. Good results at a fair price. 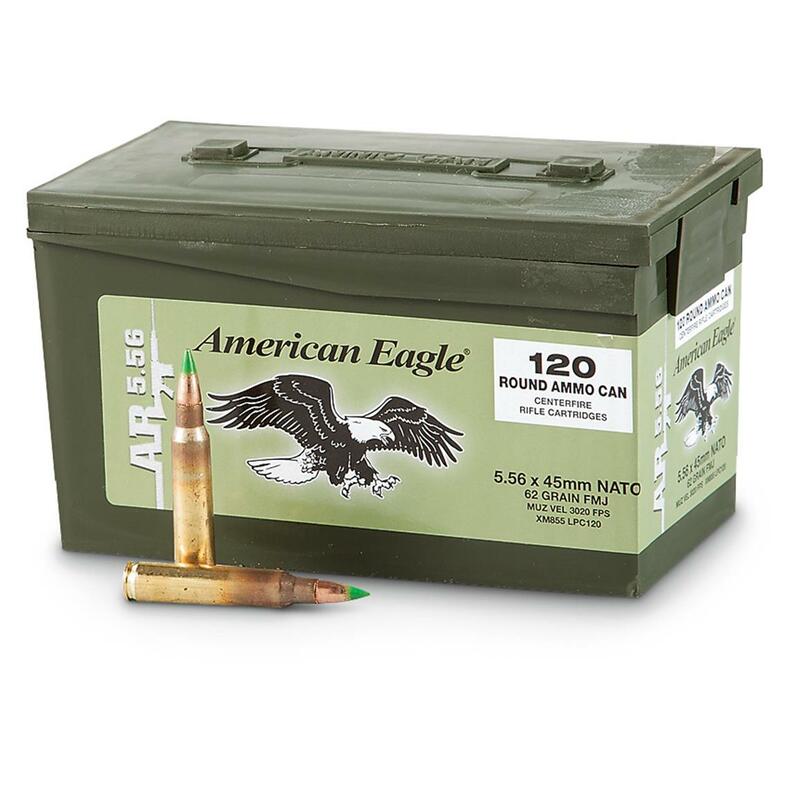 Rated 3 out of 5 by earl from NOT A REAL AMMO BOX this product is exactly what it says it is, but the ammo box is very small and plastic. not a real ammo case at all. it is just a cool looking box that the ammo is shipped in really. but other than the box being really small, everything was as described. Rated 5 out of 5 by Kevin from Gift Bought this as a gift for a friend. Rated 5 out of 5 by Oldfederale from My favorite ammo for ARs Good price (great with Federal rebate) . Quite accurate out of 1/7" twist barrels. As always with Sportsmans Guide shipping was fast.